A farmer plants a seed and tends to it while the tree grows. It won’t bear fruit overnight and instead must be watched over for years before the investment is rewarded. So too, our children must practice patience. Patience is one of the hardest virtues to learn but is invaluable to the success of a high-achieving young person. Learning to delay gratification is the mark of becoming a functioning adult and to be able to do something today that won’t produce results for days, weeks, or even years is a hard, but necessary skill to develop. As parents and coaches, we give our children the tools they need today and watch them develop those tools over a lifetime. Future black belts learn patience in several ways. Most obviously they get to see the rank on their belt increase. As they attend more classes, students are rewarded with stripes and new belt colors to signify their progress on their journey to black belt. Another way that students learn patience is through demonstrating that they are good candidates for our Black Belt Club and Leadership Team. I am asked very often by my students: how do I become part of the Black Belt Club or Leadership team. Sometimes they want my sincere advice on how to improve but other times they simply want me to tell them the ‘quick fix.’ Students always think that there might be some secret formula of techniques to master and skills to gain that will guarantee them entrance to Black Belt Club or the Leadership Team. But the truth is that there is no easy path to either of these esteemed groups. The Black Belt Club is exclusively for students who have made a commitment to train to black belt and beyond. For many young students it is the first big commitment of their lives! 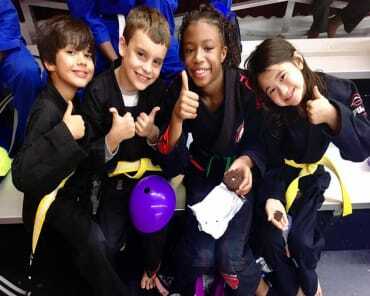 For our students who want to be lifelong martial artists and black belts, the Black Belt Club offers opportunity to train advanced techniques with a hand-selected group of teammates who will help them improve on a daily basis. This means that they will not only improve in martial arts technique, but will also develop their Leadership Resume as they work to become Leadership Team candidates.. The Leadership Team is the ultimate goal for students who want to become stewards in their community. Leadership Team candidates are not only proficient in a variety of martial arts techniques from Karate kicks, to Judo throws, to Wrestling takedowns, but they also excel at school and at home. A martial arts student must demonstrate great patience on their way to the Leadership Team. Just like I’ve told my students who are looking for the ‘quick fix,’ there is no easy path to the leadership team. Sometimes students even experience setbacks along the way and have to lean on their coaches and teammates to overcome them. Students that wish to become Leadership Candidates have to put in the work on a daily basis by making good grades, setting a good example on the mat for other students, and at home for their siblings. Just like the farmer waiting for his tree to bear fruit, a student must put in full-effort every day without seeing the immediate result. This ability to delay gratification will serve a future black belt well throughout the rest of their life. It will help the future black belt budget his time better. They can start asking themselves questions like: which is the better use of my time, an hour of Fortnite or an extra hour of reading for school? They will learn to delay gratification and choose things that may be less attractive in the present moment, but offer better returns in the future. Sometimes parents ask me if this delayed gratification can be disheartening to a student. They are concerned that a future black belt may give up before they can harvest the fruit of their labor. They would be true if we did not have a system in place to ensure that students see their progression. Luckily, the student wears that system around his waist during every class. While I deeply want my students to see and celebrate minutes improvements in their technique, sometimes future black belts need a little bit of outside motivation to stay excited about their martial arts journey. A stripe on a student’s belt is a fantastic motivating tool. It shows the student that their instructor sees that they are working hard to improve. It tells the student that they are on the right track and simply need to keep up the hard work. Delaying gratification can be very difficult for any student, but being able to receive small tokens along the way keeps students motivated and primed for success. An even bigger motivation is when a student is able to blow the instructors away at testing and earn a new belt! Testing is a vital part of the rotating curriculum at Columbus Martial Arts Academy because it helps close this feedback loop between student and instructor. Martial artists must practice patience on a daily basis, but with small rewards along the way (like new belts and stripes) they get to remain excited about the years-long path to black belt. Patience will take a young person a long way. It will help them succeed in school from elementary and secondary education, all the way through their college career and beyond! If they do not learn patience as children, when will they learn! The journey a student makes from white to black belt is hard and takes many years. The instructors at Columbus Martial Arts Academy use the rotating curriculum and incentives like belts and stripes to keep a future black belt constantly motivated. This experience is a power that a young person will draw on their whole lives through when they find a need for patience. 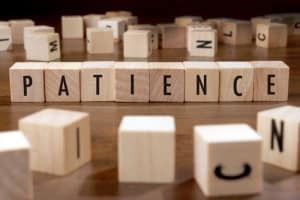 Help your child become a more patient person today!